I recently got a Thinkpad and installed Ubuntu 18.04. I am having trouble connecting to wifi but ethernet works great. I have looked around but have not found any solutions that work. Bus 001 Device 004: ID 06cb:00a2 Synaptics, Inc. Bus 001 Device 005: ID 0bda:b023 Realtek Semiconductor Corp. 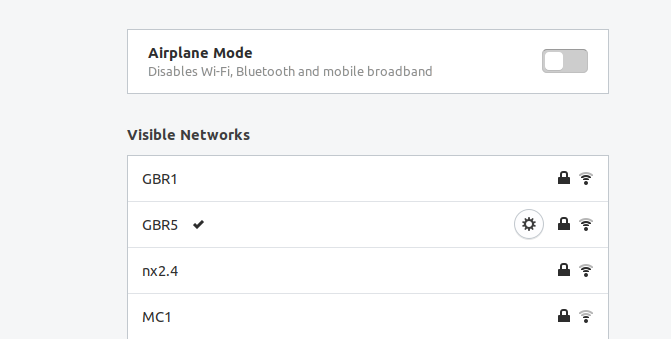 Please select Settings > WiFi and check that the Airplane Mode button is turned on. If so, please tick it off. The desired access point is set to use channel 153. In other words, the highest channel your wireless device reports as available is 140. The desired access point Orca_5GEXT is set to channel 153. Please change the settings in the router to use a fixed, not auto-select, channel in the range that your wireless card reports; for example, 132 or 136 or 140. I also note that Orca_5GEXT is set to mixed mode WPA and WPA2. WPA2-AES is preferred; not any WPA and WPA2 mixed mode and certainly not TKIP. Now are channels above 140 available? Can you now connect? Not the answer you're looking for? Browse other questions tagged networking thinkpad or ask your own question.